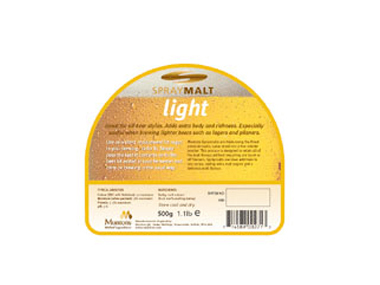 Buy Muntons Spraymalt Light 500g online from our UK Homebrew Shop. We sell Spray Malt - Light 500g and other genuine Muntons products in the UK. You can use spray malt for making beer at home. Use it instead of sugar or as a combination. Spraymalt light is great for adding body and richness. Especially useful when brewing lighter beers such as lagers and pilsners. Our UK Homebrew Shop sells real Muntons and other Sugar, Spraymalts, Hops safely online to customers throughout the United Kingdom in England, Wales, Scotland and Northern-Ireland. View more products on the Stirling Homebrew Shop from Muntons. Where to buy Muntons Spraymalt Light 500g safely online? Shop at the Stirling Homebrew Shop if you are wondering where you can buy Spray Malt - Light 500g safely online in the United Kingdom. Spraymalt Light 500g - Spray Malt - Light 500g in Sugar, Spraymalts, Hops and Homebrew.